Wimbledon: a place of tennis, a place of wombles and a place a very, very long way away from North London. I’d been putting off making the trek down to the Mystery Cube for far too long, but finally it was time to put that right. In spite of the distance, a few vague tales from cubenauts that had played (and lived to tell the tale) had drifted back to me across the Thames, and I was looking forward to an enjoyable game with a host that someone had described as “a character”. Truth be told, I’d met the two hosts briefly at Licence to Escape, the one-night popup organised by thinking bob, but without any time to really chat. Their games that night hadn’t inspired me, but Professor QB’s follow-up had convinced me that there were mitigating circumstances, so I vowed to get them in the calendar early in the New Year. The website’s pretty secretive, telling you nothing about the experience, but a search on Google Maps makes it clear that it’s slap bang in the middle of an industrial park. Not an inspiring area if I’m honest, but soon enough we’d made our way from Wimbledon South station and arrived at Cube HQ ready to join the hallowed ranks of cubenauts. Miss Terry greeted us while Professor QB finished off some experimentation upstairs, but he soon arrived to deliver our briefing. He was indeed “a character” and managed the rare feat of not boring us during the safety briefing. He slipped in and out of character nicely to give us the rules of the game, while making it clear that it obviously wasn’t actually a game but a deadly serious mission. 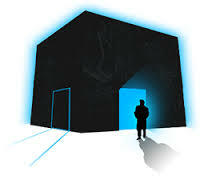 The mission you undertake in the Cube is a closely guarded secret. Professor QB was quite clear that under no circumstances should we divulge information about the objective, so all I can tell you is that you’ve got an hour to unravel the mysteries within the Cube and escape. I can’t tell you what will happen if you don’t, but success is definitely the better option. Having played Mystery Cube’s popup escape room a few months ago, I had a couple of preconceptions about the game. My main worry was that there would be lots of locks. On that count I was right – there were lots of locks to get through, but in this room it worked out OK. Yes, there were times when we had to try a key or combination in several places, but it didn’t get in the way. Aside from the obvious tedium, part of the reason I worry about lots of locks is that designers can get lazy – creating a series of very simple puzzles leading from lock to lock to lock, with little thinking and just a frenzy of dial spinning. Not here. This game revelled in throwing different types of puzzles at you. Some were of a style similar to ones I’d seen before, but there was plenty new to hold my interest. Right from the start, you were presented with a plethora of puzzles – indeed it was five minutes before I even knew what a couple of my team mates were up to. There was plenty to keep me occupied, so I just left them to get on with what they were doing. You’ll probably guess what that means – this was an “open” game where you could choose the order in which you did puzzles. Indeed, the penultimate puzzle we solved was one that had been staring us in the face since we crossed the threshold. I think that was the key to my enjoyment of this game. I worked on my own at times, and with every other member of my team at other times, in pretty much every combination possible. The puzzles lent themselves to discussion, with one person starting to spot a pattern and someone else filling it in. That’s true of many escape games, but the open nature of this room meant it was inevitable that your team mates would have come across clues that you hadn’t seen. Impressively, Mystery Cube even managed to up the ante on the search front, something which hadn’t even occurred to me was possible. There was the standard searching you’d expect from most escape rooms, but also a couple of novel forms of searching that I really liked. Given how many players find that side of things less exciting, it was nice to see them mix it up a bit. What else? Well the clue system was nice and simple – the clock screen doubled as a message system, so Professor QB or Miss Terry could slip you clues if you needed them. It’s worth mentioning the clock because I really liked it – to the point where, when I noticed it after twenty minutes, I stood and stared at it admiringly for quite a few seconds until I realised what time it was displaying. The Professor was kind enough to remember my exact words… “Aaah, nice, very nice! But…. it does feel like we’re running out of time!”. I’ll admit, I do have a tendency to get easily distracted by pretty props in rooms! We got out after 35 minutes and 35 seconds without any clues, which put us third in their all-time list. More importantly, the four of us were kept busy throughout that time solving fun puzzles. Don’t judge a book by its cover and don’t judge an escape room on a five-minute game. I regret not making the trip down earlier. There is one word that comes back again and again and again when I think about our time in the Mystery Cube: Fun. This game was an immense amount of fun, and I spent pretty much the whole game with a big smile on my face. This is a great game for first timers, for experienced players, for couples, for groups of friends and for families. In short, I think this game works for pretty much anyone – stop worrying about whether it’s a little bit further south than other games, and go and pay them a visit.